GALION — The newest member of the Galion Police Department was sworn into service at the beginning of the city council meeting on Tuesday night. K9 Basco, a Belgian Malinois, joined the GPD last November. He was purchased through Tri-State Canine Services in Warren, Ohio who specializes in police dogs and K9 training. Bringing Basco on board at the Galion Police Department was something that took nearly three years to make a reality. “Since 2015. we have had donations totaling over $19,300 directed specifically to the establishment and commitment of our K-9 program,” said GPD chief Brian Saterfield. “Galionite Pam Tischer started a Poker Run in 2015 in honor of her son, Craig Taylor, with all of the proceeds going toward the K-9 fund. The League of Motor Cycle Riders (LORMC) participated in the initial run and gave assistance to Pam and they have continued the tradition of the Poker Run. To date, the Poker Runs have presented over $7000 to our department,” continued Saterfield. All additional funds raised for the purchase of Basco were also acquired by private donations. Once the funding to purchase Basco was in the bank, it was determined Officer Tim Johnson would be the K9 dog handler. Officer Johnson and Chief Saterfield made the trip to Tri-State to choose a dog together. Since his arrival in Galion, Basco has proven a huge asset to the police department and the community. “We wanted a dog who was ready to go to work, and Basco has been ideal,” Saterfield said. Basco lives at home with Officer Johnson, his wife, and two young children who were in the room for the swearing in ceremony. Johnson and Basco are on duty from 8pm to 4am during higher crime hours. “Basco has been with the SRT Team on several searches,” said Saterfield. After being “sworn in” for official duty, Basco then put his paw print on his certificate of service. The badge he was presented with belonged to Craig Taylor, an honorary Galion Police Officer who passed away from brain cancer in 2014. Several other local donations have been made over the years to bring Basco to the Galion Police Department. They have come from The Galion Elks, AFSCME Union for the City of Galion, Simply Clean, Galion Moose, Women of the Moose, Colonel Crawford Lions Club and American Legion Scarbrough Post 243. They have also received private donations from citizens totaling over $1000. Officer Tim Johnson is pictured with his K9 partner Basco after a ceremony during Tuesday’s city council meeting. Basco was sworn in to service with the Galion Police Department by Police Chief Brian Saterfield. 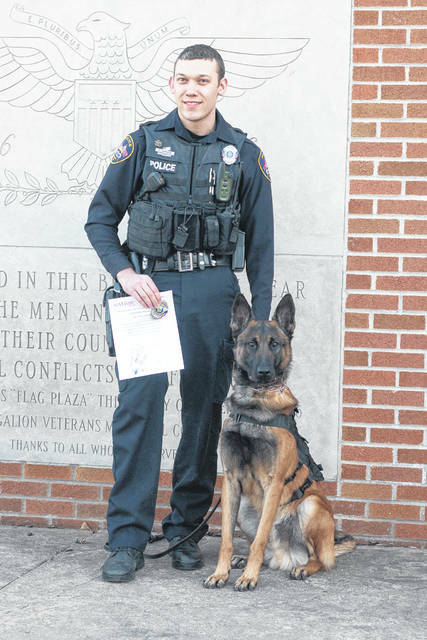 https://www.galioninquirer.com/wp-content/uploads/sites/38/2019/03/web1_IMG_7189.jpgOfficer Tim Johnson is pictured with his K9 partner Basco after a ceremony during Tuesday’s city council meeting. Basco was sworn in to service with the Galion Police Department by Police Chief Brian Saterfield.